I have a t-shirt on which is printed the slogan “Better a rainy day on a hill than a sunny day in the office”. OK, it’s not going to win awards for originality but the sentiment appeals to my love of the outdoors and of hill-walking in particular (I’m working my way through the 214 fells in the Lake District – part of my rather obsessive blokey love of lists. I reached 63 at the weekend). Anyway, I blogged a few months ago about the healing powers of the outdoors – a scientific phenomenon called biophilia – and how we humans are predisposed to be attracted to wild places as a cure for stress and anxiety. But it seems there is some evidence in neuroscience that a good walk can make you more creative. The thing is, thoughts and ideas pop into our heads all the time – hundreds, thousands of them come and go, some stay around for a while others pop in and out in seconds. We can’t possibly evaluate and connect up the infinite number of thoughts, memories and hunches that fire away in our brain at any one time. Great ideas and insights come when neurons, or thoughts, collide and a connection is made. One way to increase the chances of that happening is to ‘free your mind’ (stay with me, I’m not going all hippy) by removing yourself from the day-to-day tasks of normal living, changing your environment and avoiding the physical stimuli that would normally drive your thinking – the office, TV, bills, the in-tray, email, newspapers, internet. Some of the greatest innovations in history have come from ideas that have appeared when the thinker is not actively ‘on the job’, like in the shower, in the bath (in Archimedes case), on a walk or when reading a book on a totally unrelated subject. In his best-seller ‘Where Good Ideas Come From’, Steven Johnson recounts the story of French mathematician and physicist Henri Poincare, who suffered a distinct lack of ideas while sitting at his desk one day, so he went for a stroll and found that “ideas rose in crowds”. In his autobiography, Poincare tries to explain the sensation using an analogy of atoms hooked to a wall, stuck in some form of logical configuration when the mind is consciously addressing the subject (or problem) at hand. But when the environment changes, and the brain is ‘resting’, the physical action of walking literally loosens the atoms and shakes them from the wall, flashing them in every direction, where they collide and lead to connections (and possibly new ide as) that would otherwise never have occurred. We sometimes call this serendipity – the apparent random connection of thoughts and ideas when we’re least expecting them. Many organisations already offer ‘creative spaces’ where teams and individuals can go to brainstorm ideas and ‘be creative’. These will often have brightly coloured walls, bean bags, some toys and the odd rubber chicken. Nothing wrong with that (although some ‘innovation rooms’ I’ve seen leave a lot to be desired) but in my view they don’t go far enough. To go further, you need to go further. Go for a team walk. 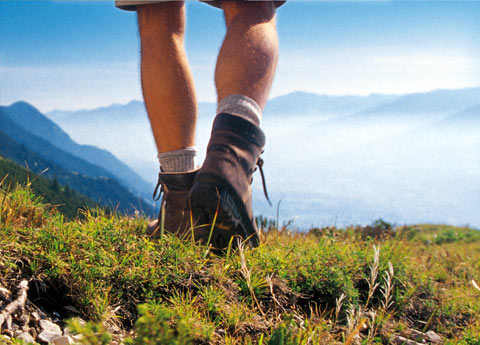 Arrange a hike up a hill or alongside a river, talking and debating as you walk. I’m always amazed at the ideas I come up with while I’m struggling up a thigh-burning incline or walking along a ridge at 3,000 feet. I’m thinking of starting up a company offering facilitated idea workshops ‘on the move’. Mmmm, I like that idea – take a team up a hill to solve a problem. Not only would they probably come up with some great ideas, but they’d bond like never before and feel better as a result. This needs some more thought … where are my walking boots? 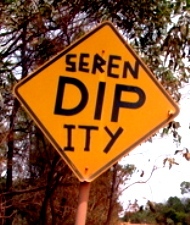 This entry was posted in Creativity, Ideas, Innovation, Neuroscience and tagged Hill, Serendipity, Walking on September 5, 2012 by creativecommunicator.